Anybody else grow up in a house where collards weren't served unless they were mixed with [insert meat/fat of choice] and cooked to DEATH? Don't get me wrong, it's always delicious! ...But we miss out on so many nutrients that way. How do I switch it up? Throw some collards in a skillet with garlic, onion, and salt/pepper for a quick sauté. Add a fried egg and you have the perfect combo. Check out the video for all the steps! These garlicky greens make the perfect "fancy" breakfast for a lazy morning. Take a break from the traditional southern side with these quick mornin' collards! Our Curry-Spiced Grain Bowl has popped up once again! This beautiful basmati brown rice blend, which include red quinoa and freekeh, is now featured on the Food & Nutrition website. If you're looking for the full recipe for this bright and savory stir-fried grain bowl, then Click Here. Everyone is looking for healthy snack ideas and we have one that is perfect for fall! Now... what comes to mind when you see the words "trail mix." I'll tell you what I see... some dry peanuts and dusty M&M's that I wouldn't touch unless I was in the midst of a famine. But it's time to remix the trail mix! Trail mix is like old-faithful. It's often mentioned as a great snack because it is an easy way to hit those salty-crunchy-sweet cravings, while still getting adequate protein, fiber, and nutrients. *insert yelling emoji* BUT IT DOES NOT HAVE TO BE BORING! I got so caught up on the traditional version of trail mix that I forgot I could simply make my own. Don't worry, I soon remembered how boss I am... and then proceeded to make my own. So... what's in the Not Your Average (Fall) Trail Mix? Apple Slices - forget all the raisins. Fall is the perfect time to enjoy apples while they're in season. Don't sleep on the dried apple rings! Pumpkin Seeds - It might be time to throw out the carved pumpkins, but I hope you kept those seeds! Pepitas (widely known as pumpkin seeds) are high in protein, magnesium, and zinc. Just roast them in a bit of olive oil and sea salt for a good munch. Cinnamon Roasted Pecans - C'mon. What more can I say? Crispy Chipotle Chickpeas - You can't have a trail mix without a crunch! Chickpeas are a good source of plant-based protein and fiber, but the crispy chipotle version takes them to a new level. Life (and trail mix) is only as boring as you make it. Clearly, we’re on a quinoa kick this month! 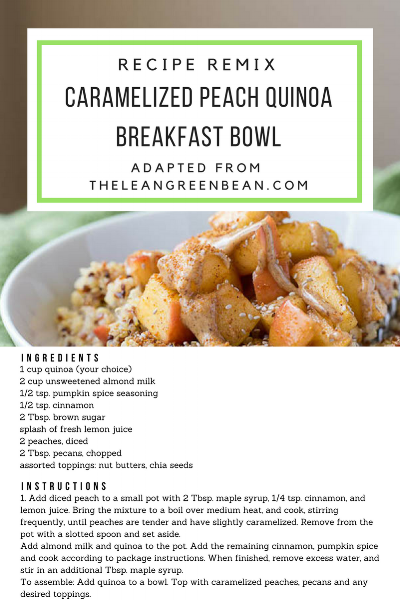 Our Recipe Remix features the stunning Caramelized Peach Quinoa Breakfast Bowl from Lindsay's blog (The Lean Green Bean). When you think of quinoa, what comes to mind? …something savory, right? Quinoa is typically used to replace rice (and other grains) in some of our favorite dinner dishes. But you can’t limit greatness! On Saturday, we will show you how to switch out your oatmeal for a warm and fruity quinoa bowl. Incorporating quinoa into your morning routine adds protein that can help keep you full and focused throughout the day. This swap is definitely worth a try! We like to think of this one as… healthy peach cobbler for breakfast. We will be live on Facebook and IG this Saturday (9/23) to show you how we put our spin on things. Until then, find the full recipe here. Hurry up and find us on social media. We want to hear from you!